"Siegel-Sanders Co. Bangor Carnival Parade Float, June 18, 1912"
"Another attractive turnout was the two horse hitch of the Siegel-Sanders Co. which was drawn by a spanking pair of chestnuts, beautifully matched. The entire body and wheels of the trap which they drew was covered with pink, while the wheels and all exposed parts not in pink were encased in lavendar, in full livery, while the ladies who occupied the rear seat wore pink and lavendar gowns to correspond with the general effect. 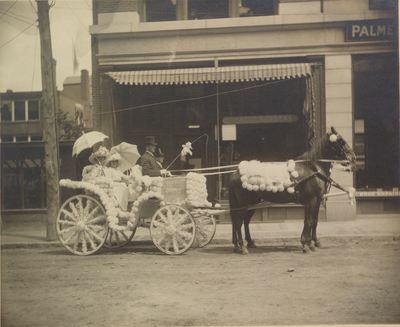 It was one of the smartest carriage exhibits to enter the parade." Nathan Sanders, a Bangor resident, and M. Siegel, a business partner who apparently lived in Portsmouth, New Hampshire, sold ladies' garments at 49 Main Street. This photograph shows 42 Columbia Street in Bangor, Maine. 42 Columbia was address of Palmer Shoe Manufacturing and Repairing Co. which is seen in the background. A Siegel-Sanders sign is in the window at 40 Columbia Street. 49 Main Street is listed in 1912 Bangor city directory as location for Siegel-Sanders, so perhaps they also owned 40 Columbia Street location, but used Main Street as the storefront. Bangor Carnival 1912, Bangor Maine history, Siegel-Sanders Co.